Everything is homemade in this friendly place, parmiggiana, caponata, pasta with fresh toppings, fish specialities, stews...Dishes are prepared like at home, using traditional Sicilian recipes. Fish and seafood is always very fresh, and carnivores got to try the hearty meat specialties like rabbit stew, pork meat with almonds and sun-dried tomatoes or roast lamb. The staff is superfriendly, quick and efficient. 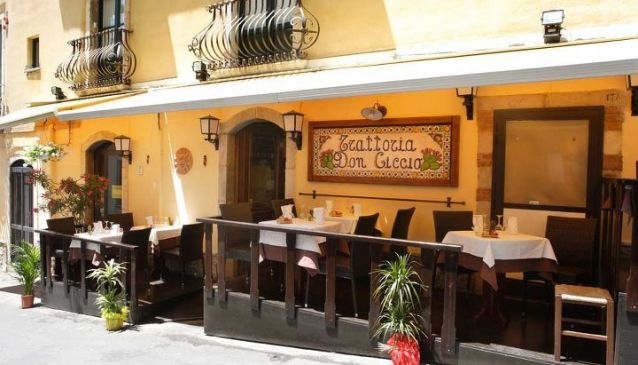 Prices are moderate for Taormina-standards and a restaurant so close to the cathedral. Our favourites are the homemade pasta with squid-ragout and for dessert the Semifreddo alla Mandorla (half-frozen almond ice cream) - a must-try!